You are here: Home / Uncategorized / Link Up Your Washi Tape Projects! Link Up Your Washi Tape Projects! Hi Washi Tape friends! We have something a little different for you today. 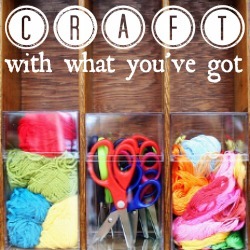 Our friend Danielle over at Framed Frosting hosts a weekly craft party – Craft With What You’ve Got. Each week she chooses a different craft medium and you link up your related craft projects – and this week is WASHI TAPE! So naturally we’re co-hosting, sharing our Washi Tape Candle and giving YOU the opportunity to link up your washi tape projects here as well! 1. Your project can be old or new, but it must use Washi Tape! 2. Make sure you link to the direct blog post, not just your blog’s homepage. 3. Take a few minutes to visit and comment on a few of the projects ahead of yours. Now link up your Washi Tape goodness!